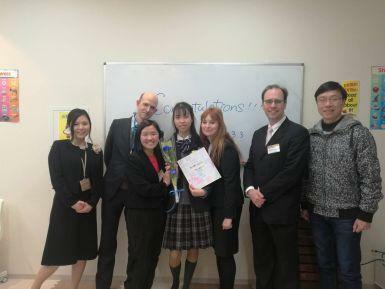 The 71st Seiritsu Gakuen Graduation Ceremony took place on Sunday, March 3, 2019 at 10am here at the Seiritsu Tokyo Campus. The graduating class was made up of 347 students, 202 boys and 145 girls. We had 2 students from the International Department among them. The school gymnasium was completely decorated with red and white traditional celebration banners covering all the walls and a large stage built. Parents arrived about one hour early, the students about half an hour even earlier to gather together in their homeroom with their homeroom teacher. The students wore their regular school uniform, not a new suit or gown like in Western countries. During the ceremony, in addition to official speeches, the class president for each class was called up to the front and they received all their classmates' graduation diplomas from the principal in a large stack. Since the ceremony was short, starting at 10am and ending about an hour later, all the students returned to their homerooms where they individually received their diplomas and said their final good-byes. The parents all stood at the back of the room to see their children complete their high school years, most taking loads of pictures. The final graduation custom for Seiritsu is the 'the last walk' in which the graduating 3rd year students walk through a narrow human corridor in the main school courtyard, lined tightly on two sides by many 1st and 2nd year students, normally bunched together in their clubs, plus parents standing behind them. It is very much like a winner's parade, as the graduates walk slowly out of the school for the last time, and their junior club members run out to give them flowers and presents as they walk by. Today's weather was not cooperating though and, with the rain, this tradition had to be moved indoors - perhaps for the first time. It was always an emotional time. Everyone took pictures with everyone else, the tears flowing freely, even from the teachers. For the graduating students: Good luck in the next stage of your life! !